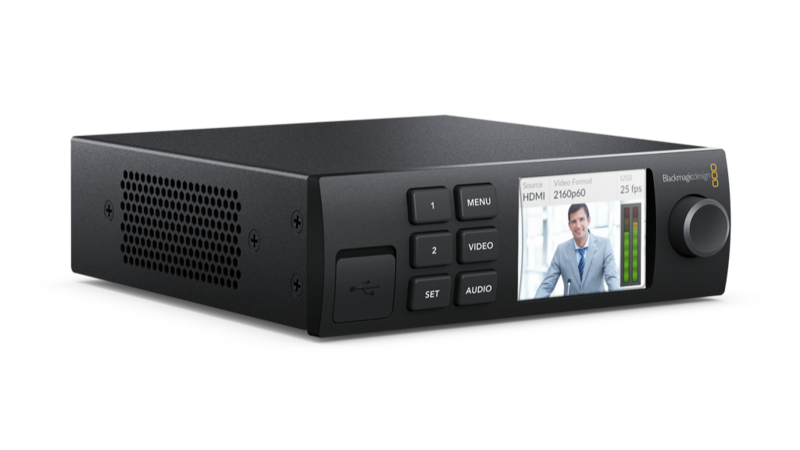 Blackmagic Design has introduced the new Blackmagic Web Presenter, which turns any SDI and HDMI video source into a 720p USB webcam for high-quality web streaming to YouTube Live, Facebook and other sources. The Blackmagic unit is compatible with all streaming software, as webcams are compatible with all streaming software, as well. The Blackmagic Web Presenter lists for $495 and is available from Blackmagic Design resellers. Fremont, California – February 6, 2017 – Blackmagic Design today announced the new Blackmagic Web Presenter, which allows customers to use their professional SDI and HDMI video sources with streaming software and services such as YouTube Live, Facebook Live, and more. Featuring 12G-SDI and HDMI connections, Blackmagic Web Presenter will down convert any SD, HD and Ultra HD sources and make them look like a 720p USB webcam. As all streaming software works with webcams, Blackmagic Web Presenter also makes it easy to work with any streaming software, but with dramatically higher quality. Streaming in 720p ensures customers get the quality of HD and a 16:9 aspect ratio, but with very low data rates so uplinking streams to the internet is easy from any computer. Blackmagic Web Presenter can also live switch programs using its built in 2 input production switcher when the optional Teranex Mini Smart Panel is installed, making it a full live production solution for location broadcast. 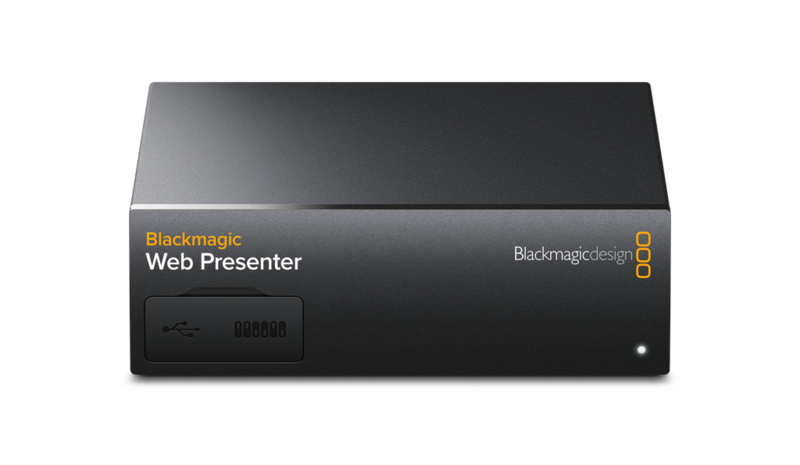 Blackmagic Web Presenter is available now for US$495 from Blackmagic Design resellers worldwide. Blackmagic Web Presenter is the fastest and easiest way to get high quality video directly on the web for a new generation of web broadcasting. It replaces expensive and hard to set up dedicated streaming encoders and lets customers or broadcasters use professional cameras to stream high quality video through their favorite software and websites. Because Blackmagic Web Presenter looks like a simple webcam, any webcam compatible software will be able to capture this USB video and audio from any broadcast quality source without the need for additional drivers. Blackmagic Web Presenter is designed for both the high end broadcaster as well as a new generation of web broadcasters. Traditional broadcasters can use Blackmagic Web Presenter to get content online quickly to a global audience from any location. AV professionals can create high quality live streams of seminars and conferences, educators can stream school performances and recitals to family members around the world, and gamers can share their gameplay with massive online communities of players. Blackmagic Web Presenter also completely revolutionizes online webinars because customers can use it as a full featured, professional live production switcher simply by adding the optional Teranex Mini Smart Panel. That means they can create webinars using multiple sources so the finished program looks better and is far more dynamic than ever before. Customers using Blackmagic Web Presenter don’t need to install any additional drivers because it is a standard UVC and UAC compatible USB video device. That means Mac, Windows, Linux and even Chromebook computers will automatically recognize Blackmagic Web Presenter as a standard webcam. This allows customers to use professional cameras to get far superior video quality, while maintaining compatibility with all of their existing software because the computer sees it as a simple webcam. Blackmagic Web Presenter works with software such as Open Broadcaster and XSplit Broadcaster, as well as popular sites like YouTube Live, Facebook Live, Skype, Twitch.TV, Periscope and more. 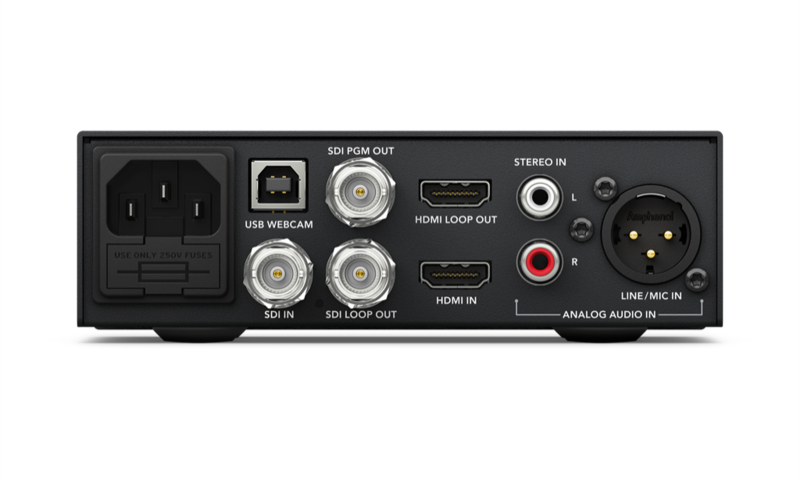 Blackmagic Web Presenter features 12G-SDI and HDMI 2.0 connections for working with all formats up to 2160p60, loop out to send the input signals back out to other devices such as a projector, and a program output to send full resolution SDI to a recorder or monitor. It also has XLR and RCA HiFi inputs for connecting microphones and other audio devices, along with a built in 90V – 240V AC power supply so customers don’t have to carry around extra power bricks or cables. Blackmagic Web Presenter is portable enough to take anywhere so customers can broadcast wherever there’s an internet connection. The compact 1/3 rack unit size is perfect for equipment racks and can be placed alongside other equipment such as Teranex Mini Converters, HyperDeck Studio recorders and even ATEM Television Studio HD. * Converts any SDI or HDMI source to USB webcam video in 720p HD format. * No drivers required, works with popular streaming software such as Open Broadcaster, XSplit Broadcaster, YouTube Live, Facebook Live, Periscope, Twitch.TV and more. * Supports all SD, HD and Ultra HD input sources up to 2160p60. * 12G-SDI input with 12G-SDI loop output. * 12G-SDI program output, ideal for recording masters when doing live switching. * HDMI 2.0 input with independent HDMI loop output. * HDMI video input re-sync for live switching. * XLR balanced mic/line level audio input. * Consumer HiFi connections for 2 channels of audio input. * Teranex quality down converter. * Built in 2 input switcher when used with optional Teranex Mini Smart Panel. * Desktop design or can be rack mounted using the Teranex Mini Rack Shelf. Product photos of the Blackmagic Web Presenter, and all other Blackmagic Design products, are available at www.blackmagicdesign.com/press/images.